I would like to walk into my grandmother’s house and be greeted by the scent of her tomato sauce bubbling on the stove in a tall metal stock pot. I’d like to see her standing over the stove with her apron caked with splashes of crushed tomatoes. I’d like to be able to hug her, have her cup my face in her hands and kiss me on the cheek, her lips dry and pencil thin. I’d like to sit down with her at the kitchen table with seating for four. The windows would be open to the street noise; a soft summer breeze would blow the sun-faded curtains that hang above the sink. The black and white TV on her counter would be tuned in to The Young & the Restless. She would bring me a plate of her homemade chocolate chip cookies with walnuts and a tall glass of cold whole milk, never watery skim like at home. Whole milk was always a special treat. She would ask me about my love life, and I’d share with her the heavy thoughts that have been weighing me down. She’d hold my hand and tell me everything will be OK. I could feel her veins in the palm of my hand, purple and blue, raised like rivers on a map. She always made me feel better. My grandma, me and braces on the night of my first semi-formal. When I think of my grandmother, I remember her hands the most, pushing and pulling dough across her kitchen table with a wooden rolling pin that looked like a stick of salami. Flour dusted her hands like powder. Ravioli, cappelletti, macaroni. She made the best pasta. I still keep her olive green leather rain coat and winter swing coat—the one with the green and gold plastic buttons—in my coat closet. I shove my hands in the pockets from time to time hoping I’ll find a memento of hers left behind, something else to cling to. I bury my nose in her coats and breathe in the memory of her. It still smells like my Nonne, a mix of makeup, Aqua Net, Kleenex and her kitchen. It’s been 14 years since she passed, and each year that passes, I pray that the scent will not fade from her coats. I don’t ever want to forget what she smelled like. Scents are powerful; they can bring us back to our childhood, the nostalgia, the longing to return to what was before I had to grow up and life got harder. Life was easier as a kid. Wasn’t it? There was always grandma’s house, where all was right in the world the moment you passed through the door. I felt safe there, but most of all, loved. Sometimes, on warm nights, the earthy smell of the air, the humid breeze, take me back to my grandmother’s TV room, where I’d sit with her for hours watching Golden Girls and The Lawrence Welk Show. We’d sit side-by-side on the couch holding hands; hers felt fragile like a bird. It was so hot you could smell the metal of the screen in the only window in the room and hear the sound of the traffic on the street, passing under the amber glow of the street lights. Right now, I’m thinking of summer days on my grandmother’s porch and the metal glider that smelled like a box of staples. I can still picture her there in her favorite chair rocking, waiting for someone to pull into the driveway and lift her spirits. I remember the two-liter bottle of red soda she kept in the house—Crystal Club’s Cherokee Red. It tasted like a carbonated cherry popsicle, and I loved it. She still offered it to me when I was older and outgrew the taste of liquid sugar in a glass, but I never refused it, and nostalgia made it still taste good. My grandmother has been appearing in my dreams a lot lately. I never remember what happened in the dream, but I do remember her presence and her sweet face smiling at me. Her entire body glows like a white aura. I always feel so good when I wake up from those dreams. Is she visiting me to tell me everything is going to be OK? In the moments when I feel lost, I still talk out loud to her, asking her to guide me, send down some good stuff from wherever she is. It is such a beautiful day today. I wish I could share this day with you. The sky is this amazing bright blue filled with feathery white clouds. It rained this morning and made the afternoon cool and breezy. … I wish I were there with you so that I could give you tons of kisses and hugs and watch the afternoon soap operas with you. I week or so later, I moved to Michigan. My life as an adult was just beginning, and hers was ending. I never did get to see her again. Yesterday my mom sent a link to an online listing of my grandma’s old house. My mom warned us that it was a mess, but curiosity made me swipe through the photos anyway. From the outside, the house looked tired and worn, the porch sunken. Inside, the walls were painted hideous colors of watermelon pink and lime green—very bad combo. It was kind of heartbreaking to see this house, that brought me so much comfort, take on a new identity. But then I reached the photo of my grandma’s kitchen and it was just as I had remembered it. The linoleum floors that looked like a mosaic of mustard yellows, olive greens and various shades of white. The original glossy, wooden cabinets and hardware, and the old-fashioned white ceramic sink. I could almost smell the containers of flour. In the photo, a ray of sunlight is shining through the kitchen windows above the sink, the only thing occupying the hollowness of the room, no sign of life. Nothing remains the same. Not even houses. But the memory, the feeling it gave you, that doesn’t fade. This is one of my favorite photos of my grandmother taken at Christmas. She is holding up VHS tapes of the Three Tenors and Andrea Bocelli. 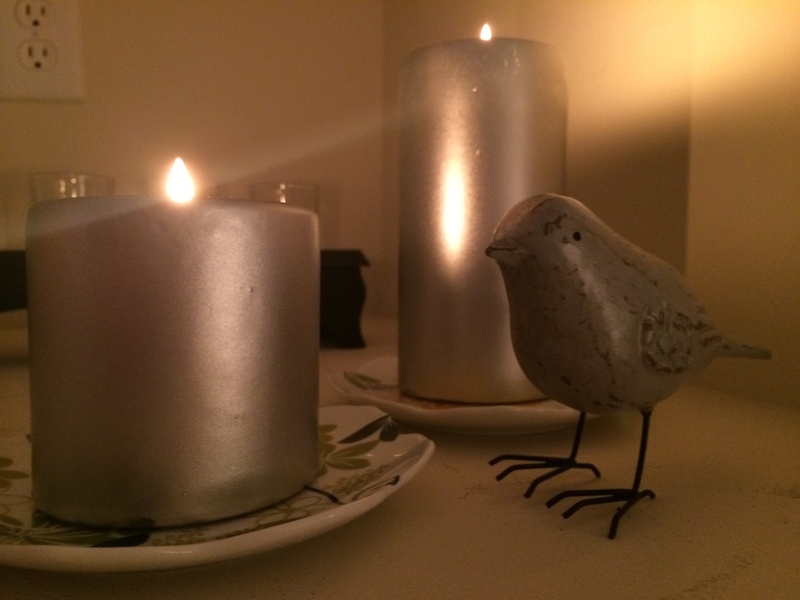 In my house, everything seems to slow down in December, creating a calm, a stillness, less urgency. There is more lounging on the couch, snug under chenille blankets that feel like rabbit fur. There are holiday movie marathons, while wearing polka dot flannel pajama bottoms and fuzzy slippers. 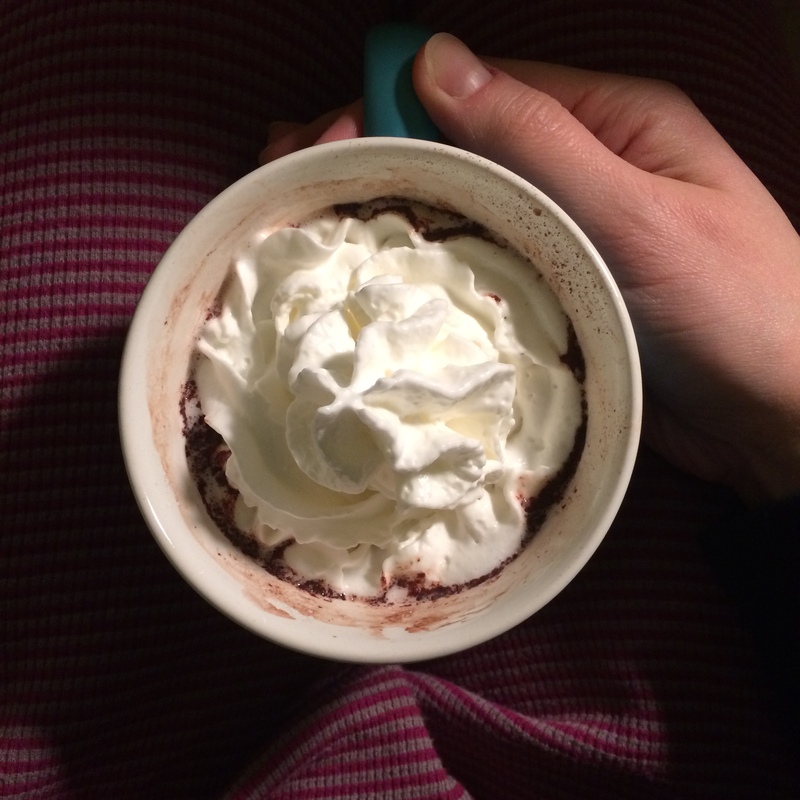 There is sea salt caramel hot cocoa and glasses of heavy red wine. And there are meals that take longer to cook, warm our insides and bring us comfort. Tarragon tomato soup, stuffed cabbage rolls, crusty garlic bread. December is like a long pause. A deep breath before another year begins and we start all over again. So I try to savor this month as much as I can and take advantage of this “pause.” I will read more, write more, reflect more. I will listen to Joni Mitchell’s “River” about 100 times – and cry 100 times – because it’s the saddest, most heartbreaking Christmas song on this planet, but also the most beautiful. I will not make many commitments or attend too many social engagements. This pause is sacred to me. For now, I just want quiet. And I want Christmas decorations. Lots of them. 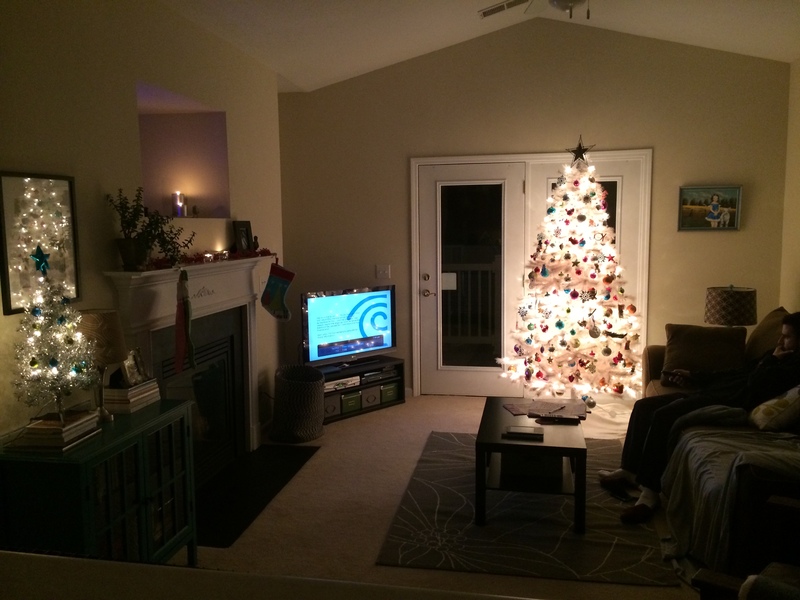 Christmas in our new home feels warm and cozy – more so than other places we’ve lived. I wonder why that is? Our new home has inspired me to buy some holiday decor, which is not something I usually do. I’m all about buying ornaments and strands of twinkle lights, but I never was one for buying holiday decor outside of tree trimming. But this year, Christmas feels different. 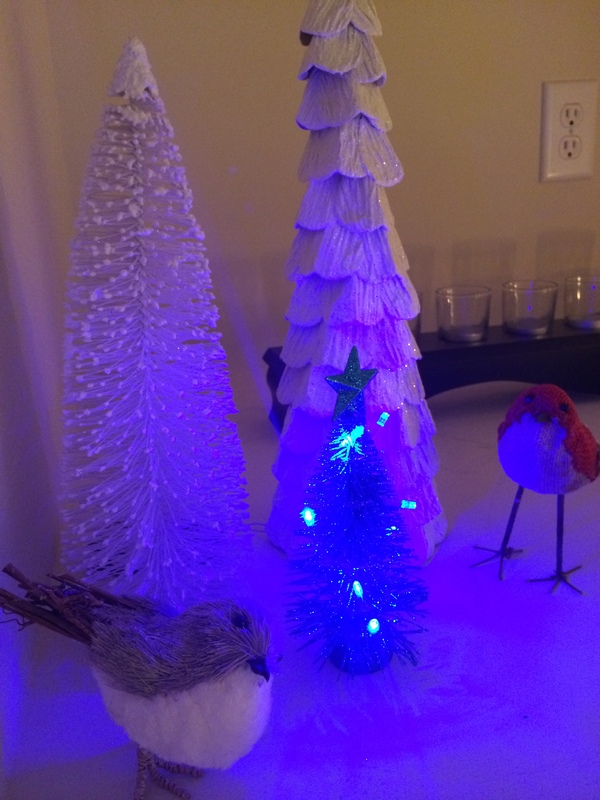 I’m happy and I want the space that I live in to reflect that, so I bought some mini Christmas trees and these adorable little birdies, in other words, simple things that make me happy. Every night, when I turn on all of our Christmas lights and light the candles on our mantle, our house feels . . . magical. See what I mean? Magical, isn’t it? 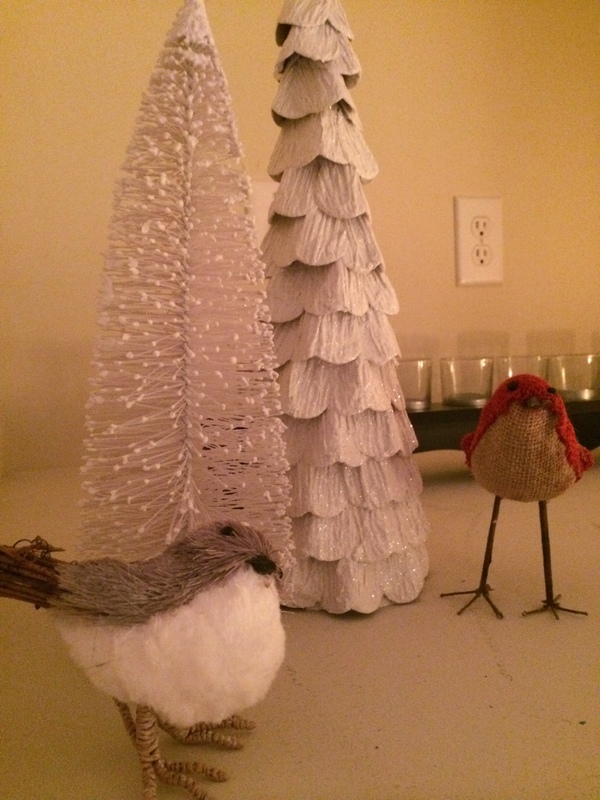 These two birdies were longing for a third little tree. So I gave in. Growing up, I loved when my mother would bring up from our basement giant cardboard boxes filled with Christmas decor. In one day, our entire house would be transformed into a winter wonderland. My mother had red and pine green candles that she only displayed at Christmas and a beautiful white and gold painted ceramic Santa. She put candles in every window and hung on the side of the house a gigantic wreath with white lights, gold ornaments and fake white snow that clung to the branches. And on one Saturday, she’d bake all of her Christmas cookies, filling the house with the scent of buttery cookie dough, toasted walnuts and cloves. Between cartoon breaks, I’d walk into the kitchen to sample her latest batch of cookies, and she’d load them on a paper plate for me to take back to the living room. My mom did Christmas right. I guess that’s where I get it from. 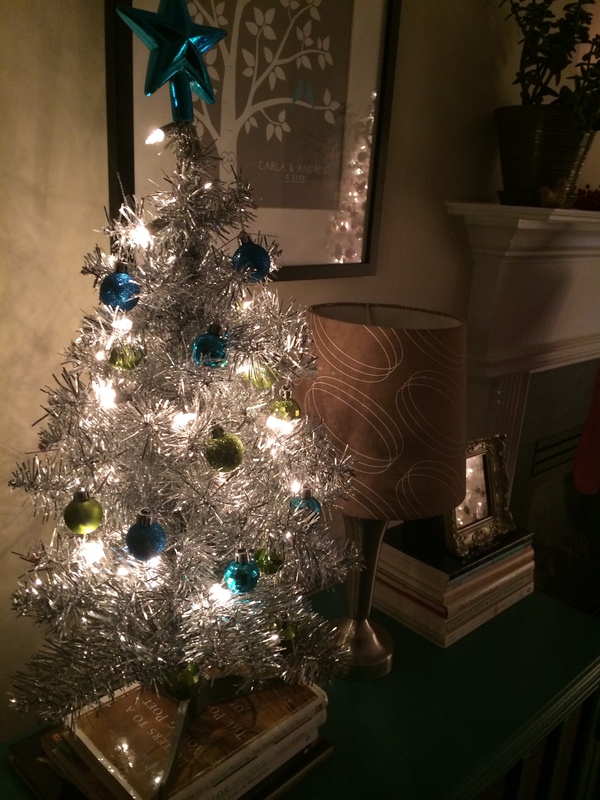 When I became an adult, the holidays brought up mixed feelings for me. I have a tendency to get a little melancholy, especially when I see others spending the holidays with their families. It’s the worst feeling in the world when your family texts you a group photo on Christmas Eve and you’re the only one not there or when your heart aches from just seeing your little nephews in their striped footie pajamas, opening their presents on Christmas day. Since I moved to North Carolina nine years ago, going “home” hasn’t been an easy option. It’s too far to drive, too expensive to fly and getting enough time off from work has always been a headache. The last time I flew home for Christmas was four years ago during the middle of my divorce. My luggage was lost (and later recovered), my flights were delayed, and, oh yeah, there was that blizzard that cancelled my return flight and left me stranded in New Hampshire for five days. The upside? I got to spend my sister’s birthday with her and bake her a chocolate cake. The downside? The morning after I finally arrived home, I was shivering in bed with a 102 fever. After that trip, I instituted a five-year rotation plan. 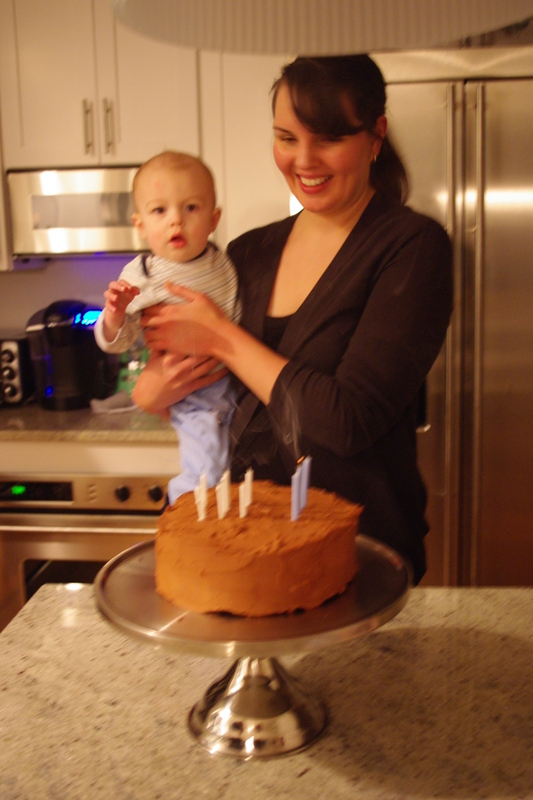 My sister, nephew, and chocolate cake. 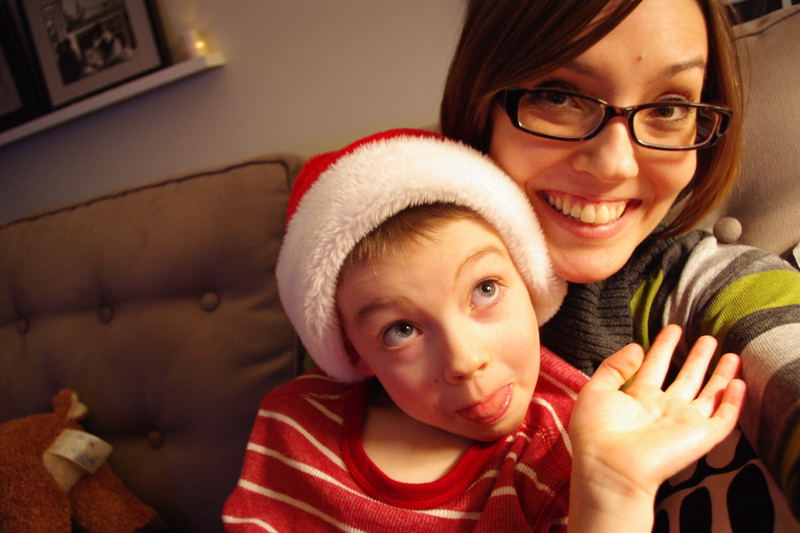 This year, however, the five-year plan has been trumped by a longing to be with family. I just can’t spend another Christmas on FaceTime. It will be the first time in four years that our whole family will be together. I cannot wait. No more FaceTime, no more photos texted across the miles, no more lost luggage and flight delays (we’re driving!). 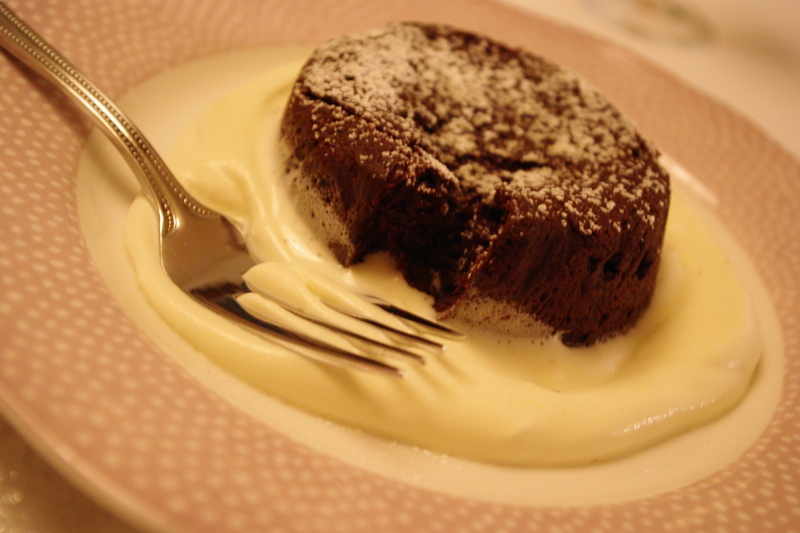 Just family – and my sister’s famous chocolate molten lava cakes. What more could I ask for? 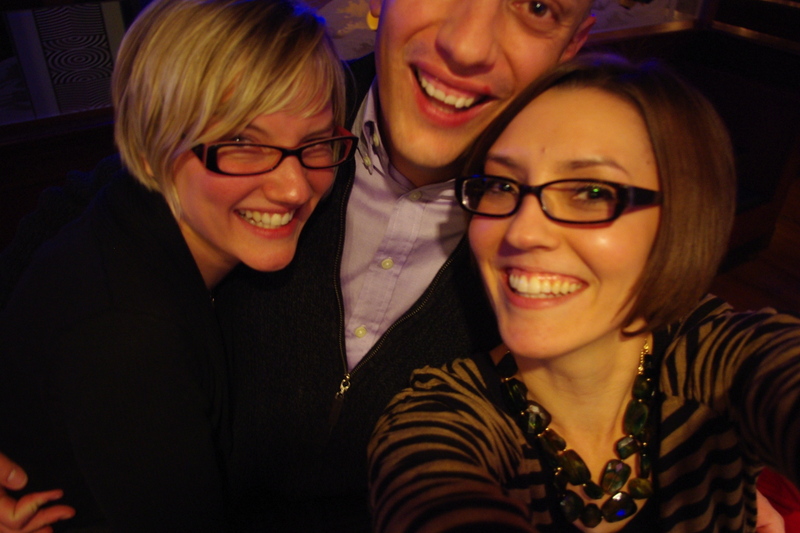 Christmas-Eve Eve shenanigans, 2010. My brother-in-law loves this photo, even though a quarter of his face is cut off.